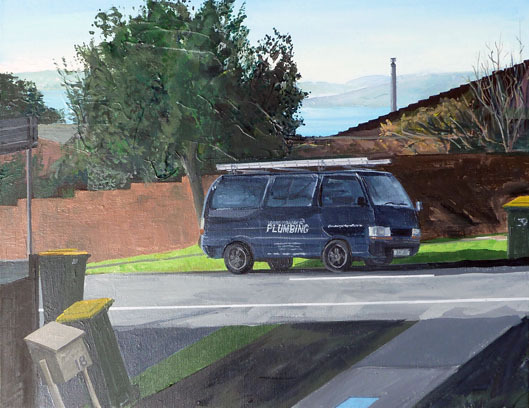 So this is the second of two pictures painted in Auckland, New Zealand. For more on the visit, see the description of the previous painting. There was some indecision about what next to paint. I wanted to keep the vantage point of the deck to keep warm and dry, so the view up the valley towards the golf course with two modern dwellings seemed the only choice. The view promised lots of grey shapes and angles with dark green trees above and above that sky. Quite a graphical image, but for some reason I was reticent about this. Instead I found if I looked back towards the house I was in, past the side of the building and up the drive. I caught a view of the road we were on. “Aberdeen Road”. Across the road stood a “Windybank Plumbers” van. There were hints of the residences on the other sided of the road, and beyond the sea and further headlands that surrounded our position. I sketched out a composition and scaled it to the canvas and away I went. I took some photos on my ipad of the scene as I figured some things might change during the few days that I would tackle this one. Indeed the plastic bins would disappear the following day. Surprisingly the van did not move during the four weekdays that I viewed the scene. Once I finished – suddenly it was on the other side of the road. My first layers of paint reflected what was in front of me at any given time. Interesting as the small triangle of roof on the left hand side was a bright mint colour in the afternoon, and the building wall above the right hand side of the garden wall became quite bright at a certain time of the day. I felt it lacked coherence and made a concerted effort to paint everything at once at a time when the line of shadow followed the near side curb of the road. This “sweet spot” turned out to be ten past ten – hence the title. I thought people might think this was when the bins would be collected, let them think that – it’s not as far as I know. I made some edits to the view. I lost some foliage bottom right on the side of our drive, as I preferred to maintain the stark graphic nature of the greys. There was also a large contained kids trampoline peeking up from the wall on the right hand side of the tree. It surprisingly moved to the right on my final day of painting. I figured it could move out of shot completely which is how I portrayed it. I did consider adding a person in front of the wall walking up the road and I took a few reference shots to use. One would often see joggers or people walking their dogs and children going to and from the primary school at the bottom of the road. I liked the starkness and mystery without, and so nixed that idea. I liked the domesticity of the scene – Having travelled so far a more sight seeing view would seem the thing to paint, but this view existed and was worth depicting in my view.